A Hollywood-style sign spelling out the name of an Essex town has been erected along the A127. 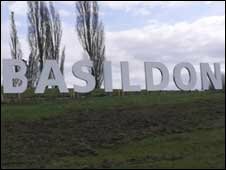 Basildon District Council hopes the giant letters will promote the town as a place to do business. It is part of a project to boost the Basildon Enterprise Parks along the A127 which is a key employment area in the region, the council said. The £400,000 project is being funded from a grant from the Thames Gateway programme.